Linda and Larry Huber from Regina, Saskatchewan served as CHES agents in Kakamega, Kenya from October 30, 2017, to February 28, 2018. It was a rewarding experience for two important reasons; we became part of CHES in Africa, an organization that has the noble vision to help young African girls become educated, and we had the opportunity to live in a very different culture and environment. We found the experience worthwhile on both counts and expect we will not be quite the same in the future because of it. The vision and mandate of CHES encapsulated in the motto “We can’t do everything . . . but we can do something!” spoke to us from the beginning of our involvement and came to life during our stay. The cultural aspect centred around the Kenyan people. We were treated with acceptance and respect from the first day. Our colleagues at CHES were kind, supportive, helpful, and generously invited us into their lives. The people we encountered in Kenyan society were welcoming, kind, and helpful. One of the most important functions we performed as CHES agents was to participate in the selection of scholarship recipients. The criteria for receiving a scholarship was well known in the Kakamega educational community. Students had to have been high achievers during their primary schooling and they had to be from “needy” backgrounds. 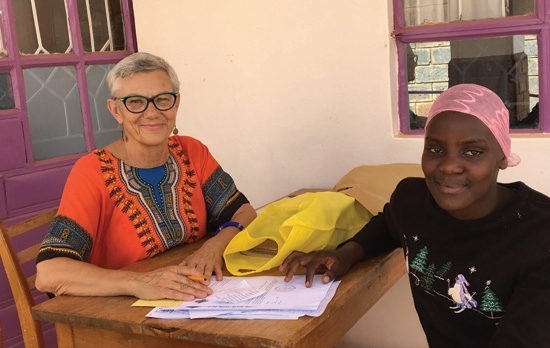 We recognized quickly that our Kenyan colleagues were committed to these criteria because they were aware from personal and first-hand experience the difference CHES scholarships made in the lives of young Kenyan girls. They had experienced hundreds of examples of girls coming from unfavourable circumstances who were able to take advantage of the opportunities provided by CHES. They kept this purpose at the forefront of what they did on a daily basis. It was striking for us as we participated in the interviews to hear that almost all the girls lived on small “shambas” of an acre or less, in one or two room mud huts with mud walls and floors and tin roofs. Electricity was seldom available and water had to be carried, often from nearby rivers. The girls shared sleeping accommodations and many had to walk long distances to attend their primary schools. Many lived in compounds containing houses of extended family, including grandparents, uncles, and aunts. As an example from the more extreme end of the continuum, although all of the applicants demonstrated need: Mary (not her real name) – father alive, 59 years old, has 5 wives and 19 children; father lives in all 5 houses, none of the children have completed secondary school, father sells bricks made out of sand, mud, and cement and makes and sells home brew. Mary’s mother is a casual labourer, digs for neighbours, and when there is no work helps make home brew. One of the comments from the Kenyan interview desk, “This girl seriously needs help”. She presented well during her agent interview, was precocious and happy. Mary received a scholarship and we met her later when we visited her school – she was happy and doing well in her studies. The interviews referenced above took place in December. We interviewed approximately 250 girls and were able to award 78 scholarships, the highest number ever. The next aspect of our stay that was very interesting and rewarding as well, took place during January when we visited the schools that have CHES girls to meet with the Principals, CHES Patrons, and visit with the girls. At each school we presented a cheque to the Principal for the CHES school fees. We met with the CHES girls as a group and each agent along with CHES’ Kenyan Office Manager had the opportunity to convey a congratulatory message to the girls. It was very rewarding and interesting to meet all of the CHES girls at their own schools as we travelled around Kakamega in a 100-kilometre radius. We also got to see more of this beautiful country and get a feel for the rural areas. In between those events we took the opportunity to do some travelling. In December near Christmas, we visited the Rondo Retreat in the Kakamega Rain Forest. In early January we travelled to Diani Beach, south of Mombassa and stayed at a resort on the Indian Ocean. We also travelled to Egypt in early February flying from Nairobi to Entebbe at 2 a.m. and on to Cairo. We had wonderful travels in Cairo, Giza, Alexandria. and a Nile Cruise from Aswan to Luxor. We concluded our time in Africa with a two-week safari in Tanzania which included the CHES office and hostel in Katesh. The safari was organized by Robb and Jeanette Taylor, long time CHES volunteers and supporters. We returned to Canada on March 14 after almost 5 months in Africa. When we decided to serve CHES in Kakamega, Kenya, many of our friends and family members had concerns. We did too. We did have experiences out of our comfort zone but adapted to our new environment, did our best, and are happy that we were able to contribute in our small way to the amazing CHES story. We want to mention that all CHES girls are required to write letters on a regular basis to their Canadian sponsors. This task is done by the girls with great care and pride as they are immensely thankful for the support they receive and wish to give a positive impression to their benefactors. The other side of the coin is the joy they feel when they receive letters from Canada. Contact with sponsors enables them to establish a personal relationship which they value highly. Finally, we close with thanks to the CHES board for the leadership and the immense amount of work they do and have done on a volunteer basis for many years that has enabled this wonderful enterprise to flourish and make a difference to the lives of Kenyan and Tanzanian girls.